San Diego Whale Watching with Flagship Cruises and Birch Aquarium Naturalists! Birch Aquarium at Scripps and Flagship Cruises and Events have teamed up for San Diego whale watching adventures for over a decade! 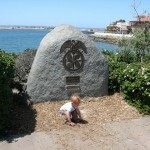 Naturalists from Birch Aquarium narrate each of the educational expeditions, which happen twice daily through mid-April. We were invited to take one such cruise, and our daughter and her grandpa had a fun adventure! While waiting for my father and daughter to board the Flagship Cruise, Naturalists from Birch Aquarium spoke with us about the gray whale migration from the Bering Sea all the way down to Baja. 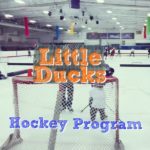 I was amazed how much I learned from speaking with them for just a few minutes. 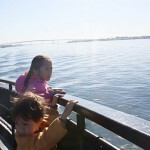 My father said the narration continued on the boat throughout the whale watching trip. 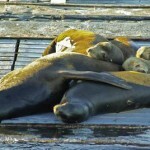 Aside from seeing gray whales, my father and daughter saw a seal, sea lions, dolphins, and different species of birds. The Flagship San Diego whale watching cruises are about 3 1/2 hours in length, and the boat ventures somewhere around 3 miles out to sea. The Naturalists from Birch Aquarium at Scripps said that they can normally spot gray whales closer to shore during the beginning of the season (December/January), and that they normally travel farther out during the mid to later part of the season. 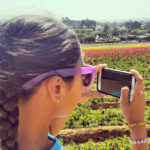 Some things you might want to plan to bring on a San Diego whale watching trip are a warm jacket, mittens, cap, camera, binoculars, and sunglasses. If you’re prone to motion sickness, it might be smart to take motion sickness medication prior to boarding. Chewing on ginger is also suppose to help ease motion sickness, so it might also be good to bring some along. Flagship Cruises and Events allows you to take snacks in a soft snack bag (no hard coolers). You can also purchase snacks and beverages on the boat. Whale watching cruises with Flagship range in price, depending upon age, and day of cruise. 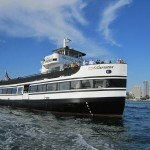 Pricing for the educational cruises are from $19 – $43. You can find a $5 off adult fare coupon (valid for up to 6 people), HERE. 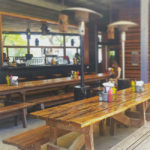 Reservations are recommended, and you may reserve by calling 619-234-4111, or online at this LINK. Whale sightings are guaranteed. If you do not see a whale, you ride again for free! Proceeds from the cruises help support educational programs, as well as exhibits at Birch Aquarium at Scripps. 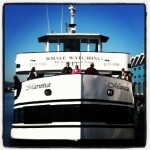 Perhaps we’ll see you on a future whale watching cruise! 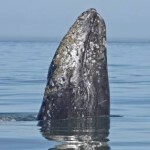 • Gray whales migrate around 10,000 miles round-trip! 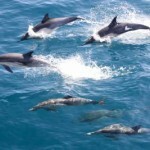 One of the longest mammal migrations in the world! 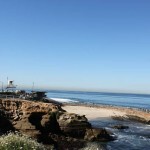 • Approximately 20,000 gray whales pass through San Diego. That’s a lot of whales! • The whales migrate to lagoons in Baja, where they rest, play, give birth, and breed. • Gray whales eat the majority of their feed at the Bering Sea, and eat very little during their migration. 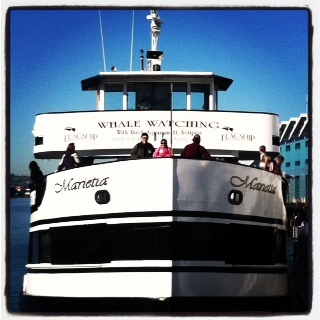 We were invited to attend a Media Whale Watching Cruise with Birch Aquarium and Flagship Cruises and Events. 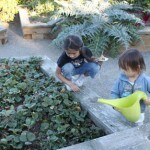 We believe many of our readers would also enjoy the activity with their families. No compensation was received for this post. Our opinions are our own. Many thanks to Birch Aquarium at Scripps and Flagship Cruises for inviting us to experience whale watching with them in beautiful San Diego. 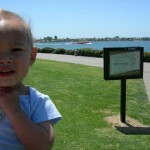 La Jolla Cove, Scripps Park, & Children’s Pool ~ Outdoor Family Fun! 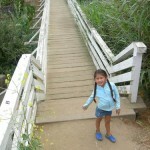 La Jolla Cove, Scripps Park, and the surrounding area is a great place for families to explore together. 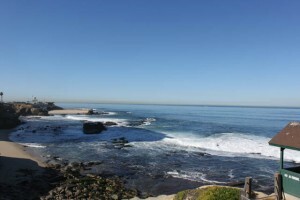 It surprises me when I talk with native of San Diegans who have never been to this area of La Jolla! It is, in my opinion, is one of the most beautiful places on Earth! 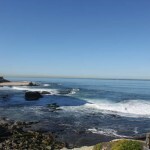 La Jolla Cove is actually an Ecological Reserve known for it’s beauty and as a popular destination for scuba divers, snorkelers, kayakers, and strong swimmers. 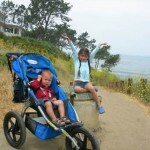 The cliffs to the east of The Cove have some GREAT hiking trails, which are easy enough to use with a jogging stroller. 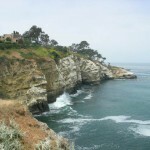 The paved path to the west of The Cove takes you on one of the most scenic walks above the Pacific Ocean. 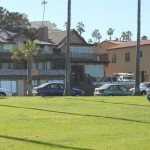 Above The Cove is Ellen Browning Scripps Park, which is a very popular place to picnic. There is no playground here, but plenty of grass to run around. 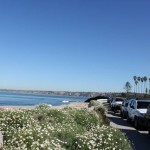 There’s also a sprawling paved path you can take from The Cove, and along Coast Boulevard which is a really scenic walk. 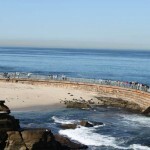 From this path you may see dolphins, seals, sea lions, and if you go at the right time of year (generally mid January through early March) you may even see the migration of the gray whales. If you follow the path away from The Cove, south of Scripps Park, you’ll come to some stairs which take you to what’s known as Shell Beach. At low tide you may be able to see some tide pools. This is not my favorite tide pooling area, but if you happen to be there at low tide you might want to check it out. Be careful of the tide, as it can be very strong when it comes to shore. Follow the path further down Coast Blvd., look out toward the ocean, and you’ll see Seal Rock just south of Shell Beach. Out on Seal Rock you’ll likely see sea lions and seals on the rocks. A large wave may come and knock them into the ocean, and you’ll see them hobble back up on the rocks again. It’s a lot of fun to watch them and take pictures. 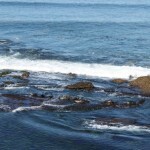 Keep walking past the cliffs above Seal Rock, and you’ll come to what’s known as The Children’s Pool. 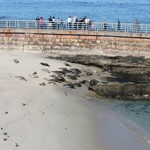 Here you’ll find more seals and sea lions on the beach. This is not a destination to have children go on the beach, but it’s a great place for kids to view the beach and mammals from a distance. Have fun! 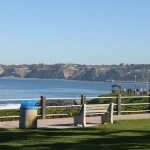 For more information about La Jolla Cove, Scripps Park, & The Children’s Pool, check the links below. San Diego’s 3rd Annual Big Bay Whale Festival is on Saturday, January 22nd, from 11am-3pm. This festival is part of Big Bay Whale Days, which celebrates the annual migration of gray whales along the coast of San Diego. The festival is taking place downtown on the Broadway Pier at the new Port Pavilion, whih is located at the end of Broadway & North Harbor Dr. The street address is 1000 North Harbor Dr.
We haven’t been to this festival yet, but it sounds very family friendly. 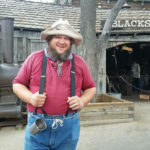 According to the Whale Days website, there will be music, a “walk-though whale”, art projects, face painting, a bouncy, “live sea creatures”, opportunities to win free whale watching rips, and more. 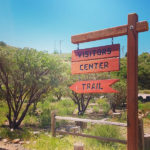 The festival is also said to give information about ecology and conservation of the gray whales, which a great lesson for both kids and adults alike. 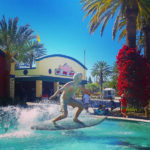 There are lots of other deals going on along with the Festival on Saturday, including a free Hornblower whale cruise for kids 12 & under with paid adult ticket, and free Old Town Trolley Tour ride for children with paid adult ticket. 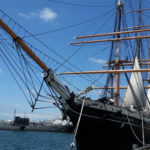 The USS Midway & Maritime Museum are offering admission specials, as well as several area merchants and restaurants. 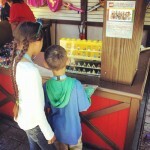 • More info about Big Bay Whale Days & Festival.